Are you interested in our Environmental Engineering Tech Degree Program? 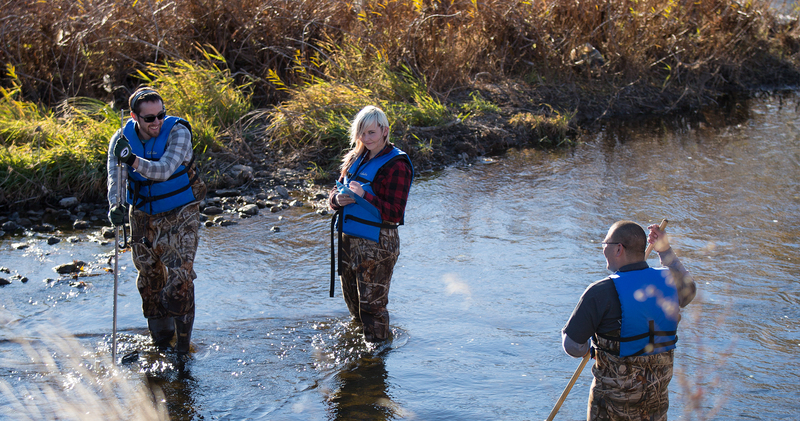 Students will gain experience in environmental sampling and monitoring throughout the program. Environmental Engineering courses provide students with an excellent balance of theory and hands-on experience that will enable them, upon graduation, to conduct environmental investigations under the supervision of professional Geologists, Engineers or Hydrologists. Courses such as Soil Testing, Field Instrumentation, Hydrology, and Field Methods, provide students with hands-on experience. Some of the other required courses in the program include Mapping, Global Positioning Systems, Surveying, and Geographic Information Systems. In addition, students take courses in communications, human relations, computers, and mathematics that will provide them with the skills necessary to advance in their careers. Program graduates primarily work outdoors in the field, collecting information used to assess how increased demand affects the quality and quantity of our nation’s natural resources. Our Environmental Engineering Tech graduates work in a broad range of jobs such as collecting and analyzing water and soil samples, measuring stream flow and groundwater levels, and conducting soils testing. The work can be physically demanding, requiring technicians to climb or hike long distances, carrying equipment to remote locations. The job often entails working under varying climatic conditions for extended periods. Technicians may be required to drive off-road vehicles such as 4-wheelers and snowmobiles, or even ride horses, boats or helicopters, to access some remote sampling sites. Environmental engineering technicians carry out the plans that environmental engineers develop. They test, operate, and, if necessary, modify equipment used to prevent or clean up environmental pollution. They may collect samples for testing, or they may work to mitigate sources of environmental pollution. Employment of environmental engineering technicians is projected to grow 10 percent from 2014 to 2024, faster than the average for all occupations. Employment in this occupation is typically tied to projects created by environmental engineers. State and local governments are expected to focus their efforts and resources on efficient water use and wastewater treatment, and thus to increase demand for environmental engineering technicians. The median annual salary for an Environmental Engineering Technician is $48,650.